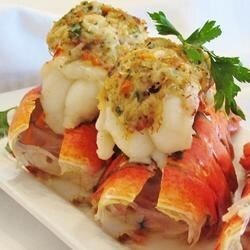 "Lobster tail with a New England-style cracker and crabmeat stuffing. Serve with fresh lemon wedges and homemade dinner rolls for an exquisite but surprisingly simple meal." Lightly mix the crushed crackers, crabmeat, 1/4 cup of clarified butter, parsley, seafood seasoning, garlic, lemon zest, lemon juice, salt, and white pepper in a bowl until thoroughly combined. Bake the lobster tails in the preheated oven until the meat is opaque and the stuffing is golden brown on top, 10 to 12 minutes. An instant-read thermometer inserted into the thickest part of the lobster tail should read 145 degrees F (65 degrees C).